She has been incredibly busy promoting her new all-female blockbuster Ocean's Eight, alongside co-stars Sandra Bullock, Anne Hathaway and Sarah Paulson. But Rihanna treated herself to a rare night off on Saturday, and caught up with friends in London's Mayfair. The Diamonds hitmaker, 30, slipped her envy-inducing figure into a slinky LBD as she arrived at swanky Mexican eatery Peyote. The chart-topped commanded attention in the dress, which pulled into a chic strapless neckline and clung to her slender figure all the way down. Keeping co-ordinated from head to toe, the Bajan beauty accessorised with a matching choker and handbag, before tying her look together with quirky black and perspex heels. Styling her hair into big, bouncy waves and sporting a classic red lip, Rihanna exuded natural glamour as she headed inside for a night of revelry. When it comes to shoes, Rihanna has got expensive taste. Chanel, Christian Louboutin, Balenciaga... you name it, she's worn it. Plus of course, pieces from her collaborations with both Manolo Blahnik and Puma! This time she accessorized her little black dress with a pair of patent leather and perspex strap mules, which are by Giuseppe Zanotti. They're so simple but oh so effective with a nice little nod to the Nineties. But the really good news is that not only are RiRi's exact sandals available to buy, they're now reduced in the sale! What are you waiting for? Click (right) to add them to your NET-A-PORTER basket. Alternatively, treat your feet to one of the similar options we've rounded up for you in the edit below. Rihanna is no doubt enjoying a few evenings off, after a busy stint promoting her newest film Ocean's Eight. The flick features an all-star female cast, and is a continuation of Steven Spielberg's famous Ocean's trilogy, first released in 2001. The newest installment follows Sandra Bullock as Debbie - the estranged sister of George Clooney's famous character Danny Ocean, who attempts to pull off a $150 million heist at the Met Gala. 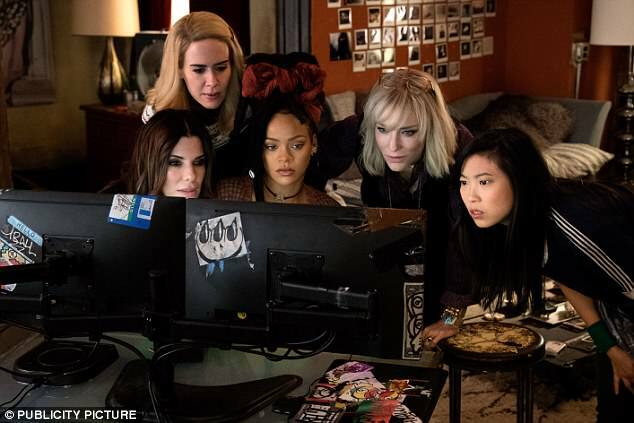 Rihanna portrays Nine Ball, a tech genius, while Sarah Paulson plays surburban mother Tammy and Mindy Kaling stars as a jewellery maker. Helena Bonham Carter appears as Rose Weil, a fashion designer, while Anne Hathaway plays celebrity Daphne Kluger, who is the target of the heist. Despite the film's hectic promotional trail, the Umbrella hitmaker also managed to find time to launch a pop-up store for her new lingerie range in Shoreditch. The collection, titled Savage x Fenty, is a follow on from her hugely successful make-up range, Fenty Beauty.